Auto Union AG, Chemnitz, was an amalgamation of four German automobile manufacturers, founded in 1932 and established in 1936 in Chemnitz, Saxony, during the Great Depression. It is the immediate predecessor of Audi as it is known today. As well as acting as an umbrella firm for its four constituent brands (Audi, Horch, DKW, Wanderer), Auto Union is widely known for its racing team (Auto Union Rennabteilung, based at Horch works in Zwickau/Saxony). The Silver Arrows of these two German teams (Mercedes-Benz and Auto Union) dominated not only GP car racing from 1934 onwards but set records that would take decades to beat, such as the fastest speed ever attained on a public road (at 432.7 km/h (268.9 mph), unbroken as of 2013). After being reduced to near ruin in the aftermath of World War II, Auto Union was re-founded in Ingolstadt, Bavaria in 1949, ultimately evolving into the modern day Audi company following its takeover by Volkswagen in 1964 and later merger with NSU Motorenwerke in 1969. Zschopauer Motorenwerke J. S. Rasmussen (brand DKW – steam-driven car) founded by Danish engineer Jørgen Skafte Rasmussen in 1916, it branched out into motorcycles, and then front-drive two-stroke cars built at Audi works in Zwickau since 1931. Horch – founded 1904 by August Horch in Zwickau. It built cars starting from straight-two engines to luxury models with V8- and V12 engines. Audi – because of disputes with the CFO, August Horch in 1909 left his namesake enterprise and founded Audi across town, building inline-four-, six- and eight-cylinder-engined cars. In 1928 Audi became a subsidiary of Zschopauer Motorenwerke. In August 1928, Rasmussen, the owner of DKW, acquired a majority ownership of Audiwerke AG. In the same year, Rasmussen bought the remains of the US automobile manufacturer Rickenbacker, including the manufacturing equipment for eight- and six-cylinder engines. These engines were used in Audi Zwickau, Audi Imperator and Audi Dresden models. At the same time, six-cylinder and four-cylinder (licensed from Peugeot) models were manufactured. In 1930 the Saxony Regional Bank, which had financed Rasmussen's business expansion in the 1920s, installed Richard Bruhn on the board of Audiwerke AG, and there followed a brutal pruning and rationalization of the various auto-businesses that Rasmussen had accumulated. The outcome was the founding in Summer 1932 of Auto Union AG with just four component businesses, being Zschopauer Motorenwerke with its brand DKW, Audi, Horch and the car producing piece of Wanderer, brought together under the umbrella of single shareholder company Auto Union. Although all four brands continued to sell cars under their own names and brands, the technological development became more centralized, with some Audi models employing engines by Horch or Wanderer. At fellow director's Adolf Rosenberger insistence, von Oertzen met with Dr. Ferdinand Porsche, who had done work for him before, and developed his own P-Wagen project racing car based on the new 750 kg (1,650 lb) formula. German racing driver Hans Stuck Sr. had met Hitler before he became Chancellor, and not being able to gain a seat at Mercedes, accepted the invitation of Rosenberger to join him, von Oertzen, and Porsche in approaching the Chancellor. In a meeting in the Reich Chancellory, Hitler agreed with Porsche that for the glory of Germany, it would be better for two companies to develop the project, resulting in Hitler agreeing to pay ₤40,000 for the country's best racing car of 1934, as well as an annual stipend of 250,000 RM (₤20,000) each for Mercedes and Auto Union. (In time, this would climb to ₤250,000.) This highly annoyed Mercedes, who had already developed their Mercedes-Benz W25, which nevertheless was gratified, its racing program having financial difficulties since 1931. It resulted in a heated exchange both on and off the racing track between the two companies until World War II. 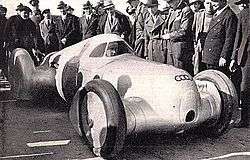 The Auto Union racing cars types A to D were built as Grand Prix racing cars from 1934 to 1939. 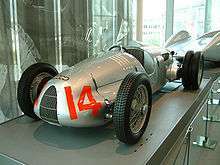 They resembled the earlier Benz Tropfenwagen, also built in part by Rumpler engineers, The only Grand Prix racers to wear Auto Union's four-ringed logo, they were particularly dominant in 1936. From 1935 to 1937, Auto Union cars car won 25 races, driven by Ernst von Delius, Bernd Rosemeyer, Hans Stuck Sr., and Achille Varzi. Much has been written about the difficult handling characteristics of this car, but its tremendous power and acceleration were undeniable – a driver could induce wheelspin at over 100 mph (160 km/h). The cars used supercharged piston engines; eventually producing almost 550 hp (410 kW; 560 PS), designed to provide optimum torque at low engine speeds. Rosemeyer would later drive one around the Nürburgring in a single gear, to prove the engine was flexible enough to do it. The fuel tank was located in the centre of the car, directly behind the driver (who would be placed well towards the front), so the car's front-rear weight distribution would remain unchanged as fuel was used – exactly the same location used in modern open-wheel racing cars, and for the same reason. The chassis tubes were initially used as water carriers from the radiator to the engine, but this was eventually abandoned after they often sprung small leaks. The list of drivers for the initial 1934 season was headed by Stuck; he won the German, Swiss, and Czechoslovakian events, along with wins in a number of hill climbs, becoming European Mountain Champion. In 1935, the engine had been enlarged to 5 L (305 cu in) displacement, producing 370 bhp (276 kW; 375 PS). Achille Varzi joined the team and won the Tunis Grand Prix and the Coppa Acerbo. Stuck won the Italian Grand Prix, plus his usual collection of hill-climb wins, again taking the European Mountain Championship. The new sensation, Rosemeyer, won the Czech Grand Prix. Stuck also managed to break speed records, reaching 199 mph (320 km/h) on an Italian autostrada in a closed-cockpit streamliner. Lessons learned from this streamlining were later applied to the T80 land speed record car. For 1936, the engine had grown to a full 6 L (366 cu in), and was now producing 520 bhp (388 kW; 527 PS); in the hands of Rosemeyer and his team-mates, the Auto Union Type C dominated the racing world. Rosemeyer won the Eifelrennen, German, Swiss, and Italian Grands Prix, as well as the Coppa Acerbo. He was crowned European Champion (Auto Union's only win of the driver's championship), and also took the European Mountain Championship. Varzi won the Tripoli Grand Prix, while Stuck placed second in the Tripoli and German Grands Prix, and Ernst von Delius took second in the Coppa Acerbo. In 1937, the car was basically unchanged and did surprisingly well against the new Mercedes-Benz W125, winning five races to the seven of Mercedes-Benz. Rosemeyer took the Eifel and Donington Grands Prix, the Coppa Acerbo, and the Vanderbilt Cup. Rudolf Hasse won the Belgian Grand Prix. In addition to the new 3 L (183 cu in) formula, 1938 brought other challenges, principally the death of Rosemeyer early in the year, in an attempt on the land speed record on a German autobahn. Tazio Nuvolari joined the team, and won the Italian and Donington Grands Prix, in what was otherwise a thin year for the team, other than yet another European Mountain Championship for Stuck. In 1939, as war clouds gathered over Europe, Nuvolari won the Yugoslavia Grand Prix in Belgrade, while Hermann P. Müller won the 1939 French Grand Prix. The buildup and onset of World War II encouraged the development and production of special vehicles for military purposes in the 1930s. Auto Union became an important supplier of vehicles to Germany's armed forces. Following the outbreak of war, civilian production was interrupted in May 1940. After this, the company produced exclusively for military purposes. 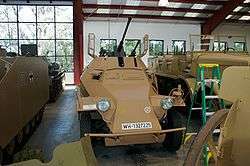 During World War II, Auto Union/Horch supplied the chassis for the Sd-Kfz 222 armored car. Powered by an 90 PS (66 kW; 89 hp) Horch V8 engine, it reached a top speed of 50 mph (80 km/h) on the road. The all-wheel drive Kfz 11, or Horch/Wanderer Type 901, was used as a medium transport vehicle to shuttle German military officials. Horch works also produced the AWD heavy transport vehicle Type 801 (both named Einheits-PKW der Wehrmacht). From the beginning of 1944, Auto Union plants (Horch and Audi plant at Zwickau, Mitteldeutsche Motorenwerke and Siegmar/Wanderer plant at Siegmar-Schönau) were heavily bombed and severely damaged. The U.S. Army occupied Zwickau on 17 April 1945 near the end of WWII. After withdrawal of the U.S. Army on 30 June from Zwickau, all Saxon plants of Auto Union were occupied by the Red Army. Postwar, the Saxon plants of Auto Union were located in the Soviet-occupied zone of communist East Germany. In 1945, on the orders of the Soviet Military Administration in Germany, the factories were dismantled as war reparations, while the racing cars found stored in a colliery were returned to Moscow for reverse engineering. Following this, Auto Union AG assets were liquidated without compensation. On 17 August 1948, Auto Union AG of Chemnitz was deleted from the commercial register. The remains of Horch and Audi plants of Zwickau became the VEB (for "People Owned Enterprise") Automobilwerk Zwickau, or AWZ; Automobile Factory Zwickau). The former Audi factory in Zwickau, now under East German control, restarted assembly of the pre-war models in 1949. 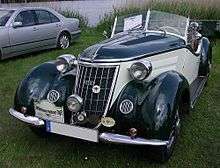 Those models were renamed IFA F8 and IFA F9 and were similar to the new West German DKW versions. In time, a lawsuit compelled the East Germans to cease using the DKW brand. The factory went on to manufacture the infamous Trabant until the early 1990s, when it was acquired by Volkswagen, effectively re-establishing its connection with Auto Union and Audi. With the Red Army quickly advancing on Zwickau immediately after the war, and faced with the prospect of trying to salvage what was left of the company Auto Union's executives had no option but to flee and re-establish the company on Western side of the partitioned Germany. Thus a new Auto Union company was launched in Ingolstadt, Bavaria with loans from the Bavarian state government and Marshall Plan aid. The reformed company Auto Union GmbH was launched on 3 September 1949. The Ingolstadt facility had been run purely as a spare parts operation since 1945, but eventually the directors found the funding to restart production – initially in a converted granary building in the town. With West Germany still in the early stages of rebuilding its economy after the war, the demand for cheap transport meant that only the DKW brand would survive into the post-war era. The luxury focused Audi and Horch brands were placed into dormancy, whilst Wanderer had been the property of its original parent firm. Auto Union therefore continued DKW's tradition of producing affordable front-wheel drive vehicles with two-stroke engines. This included production of the small but sturdy DKW RT 125 W motorcycle and a delivery van known as DKW Schnellaster. Many employees of the Saxony factories in Zwickau (Audi and Horch factories), Chemnitz (Siegmar plant, former Wanderer) and Zschopau (DKW Motorcycle factory) came to Ingolstadt and restarted the production. In 1950, after a former Rheinmetall-Borsig factory in Düsseldorf-Derendorf was established as a second assembly facility, the company's first post-war car went into production: the DKW Meisterklasse F 89 P, available as a sedan/saloon, a station wagon and the four-seater convertible built by Karmann. 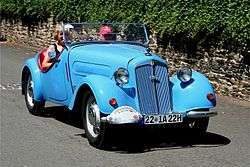 The F 89 were based on the DKW F8 (motor) and the DKW F9 (coachwork) pre-war constructions. In response to pressure from Friedrich Flick, then their largest single shareholder, Daimler-Benz acquired 87% of Auto Union in April 1958, taking complete control in the following year. In 1958 it saw the return of the Auto Union brand, represented by the Auto Union 1000, a small saloon. At the same time the 1000 Sp, a stylish coupé, was produced for Auto Union by the coachbuilder Baur at Stuttgart. Under Daimler-Benz ownership the company invested heavily in the Ingolstadt plant. Car production at Düsseldorf was ended, and the plant became the centre of production for Mercedes-Benz commercial vehicles like the Mercedes-Benz L 319 – a role which it continues to the present day. The DKW and Mercedes brands were able to establish a greater presence in the North American market by an agreement with the Studebaker-Packard Corporation in 1956 which through 1964 was the only distributor in the United States. Because of SPC's large network of dealers, the Auto Union and Mercedes-Benz brands were able to expand much faster in the US markets. Many dealers today can trace their origin back to being Studebaker-Packard dealerships. 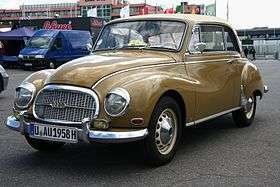 However, as prosperity began to return to West Germany, and as West German products gained valuable currency through export to the rest of Europe and North America, Daimler became increasingly worried that Auto Union's only market for its two-stroke products, without massive investment, would be impoverished East Germany. Two-stroke engines became less popular towards the middle of the 1960s as customers were more attracted to the more refined four-stroke engines. They began selling shares, which with the agreed help of the West German Government, were acquired by Volkswagenwerk AG. In 1964, Volkswagen acquired the factory in Ingolstadt and the trademark rights of Auto Union, with the exception of the dormant Horch brand which Daimler-Benz retained. 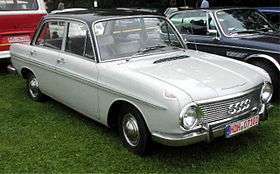 A programme that Daimler had initiated at Auto Union created a range of cars that would subsequently provide the basis for Volkswagen's line of front-wheel-drive models, such as the Audi 80 and Volkswagen Passat. At the time a new model, internally designated F103, was under development. This was based on the last DKW model, the DKW F102, with a four-stroke engine implanted and some front and rear styling changes. Volkswagen abandoned the DKW brand because of association with two-stroke engines, effectively leaving Volkswagen with the Audi brand. The new model was launched in September 1965 as simply the "Audi." The name was a model designation rather than the manufacturer, which was still officially Auto Union. As more models were later added to the Audi range, this model was renamed Audi 72. In 1969, Auto Union merged with NSU Motorenwerke AG, based in Neckarsulm, near Stuttgart. In the 1950s, NSU had been the world's largest manufacturer of motorcycles, but had moved on to produce small cars like the NSU Prinz, the TT and TTS versions of which are still popular as vintage race cars. NSU then focused on new rotary engines based on the ideas of Felix Wankel. In 1967, the new NSU Ro 80 was a space-age car, well ahead of its time in technical details such as aerodynamics, light weight, and safety but teething problems with the rotary engines put an end to the independence of NSU. The mid-sized car NSU had been working on, the K70, was intended to slot between the rear-engined Prinz models and the futuristic NSU Ro 80. However, Volkswagen took the K70 for its own range, spelling the end of NSU as a separate brand. In May 2009, Porsche gained majority control of Volkswagen Group and proposed a merger of the two companies. In August 2009, Volkswagen AG's supervisory board signed the agreement to create an integrated Auto group with Porsche led by Volkswagen. Volkswagen will initially take a 42% stake in Porsche AG by the end of 2009, and see the family shareholders selling the automotive trading business of Porsche Holding Salsburg to Volkswagen. Rumors began to appear in the press the name Auto Union would be revived for the new group holding company. 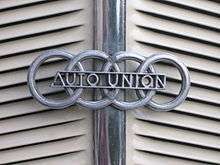 Although Auto Union used the four ring logo, it was only used on Auto Union racing cars in that period, while the member companies used their own names and emblems. Auto Union was tributed at the 1999 Monterey Historic Automobile Races. ↑ Four Rings: The Audi Story. Audi AG. 1 August 2013. ISBN 978-3768826730. 1 2 3 Audi website "Archived copy". Archived from the original on 4 February 2009. Retrieved 4 February 2009. 1 2 3 4 "Auto Union Type C". DDavid.com. Retrieved 2009-06-20. 1 2 3 4 Audi website "Archived copy". Archived from the original on 4 February 2009. Retrieved 27 April 2009. 1 2 "Audi Worldwide> Home". Audi.com. 15 April 2009. Retrieved 2009-04-27. ↑ "Spiegel Wissen: Auto Union (german)". Retrieved 2008-09-21. ↑ Chris Hallett (15 May 2009). "The return of Auto Union". AutoCar. Archived from the original on 18 May 2009. Retrieved 2009-06-21. ↑ Car Logo. "Audi Logo". Archived from the original on 30 September 2007. Retrieved 2007-09-10. ↑ "History of the Four Rings-Part 1-Audi Auto Union". Seriouswheels.com. Retrieved 2009-04-27. ↑ Monterey Historics 1999. Audiworld.com (1 September 1999). Retrieved on 2013-07-16. Wikimedia Commons has media related to Auto-Union vehicles. Sports car Monza 1000 Sp.